A BioPen that uses special ink to ‘colour in’ and treat eye wounds has taken a giant leap towards being commercially available, after the NSW Medical Devices Fund awarded its creators $1.1 million. Professor Gerard Sutton and his team from the University’s Save Sight Institute have developed a corneal pen, known as the iFix, which seals eye wounds to treat corneal ulceration, promote active healing of the wound site and reduce scarring. The 3D printing pen works by releasing bioink directly onto the eye to help corneal cells regenerate and create a biological barrier to ongoing damage, including infection. The technology is based on intellectual property that is jointly owned between the University of Sydney and the South Eastern Sydney Local Health District. Corneal ulceration is a common problem in Australia and developing countries. Each year around 55,000 Australians present to hospitals with corneal ulcerations and this invention could potentially benefit many thousands of patients locally and across the globe. Professor Sutton’s research has shown that the pen can accelerate feeling, minimise patient pain and reduce their recovery time, through deployment of antibiotics. On Wednesday night NSW Minister for Health and Minister for Medical Research Brad Hazzard announced that the Save Sight Institute team would receive a $1.1 million grant from the NSW Medical Devices Fund, to progress commercialisation of the iFix pen. The fund invests in the development and commercialisation of medical devices and related technologies. The grant follows the team’s success last year in winning the inaugural Sydney Research innovation challenge – The Big Idea. That victory earned them $45,000 in pre-seed funding to further develop the iFix concept. Animal testing of the iFix pen is already underway and Professor Sutton’s team is planning to undertake a phase 1 human trial next year. The NSW Medical Devices Fund awarded funding to seven projects at Wednesday night’s event at Parliament House. Since its inception in 2013 the fund has allocated more than $50 million in grants to 31 technologies. 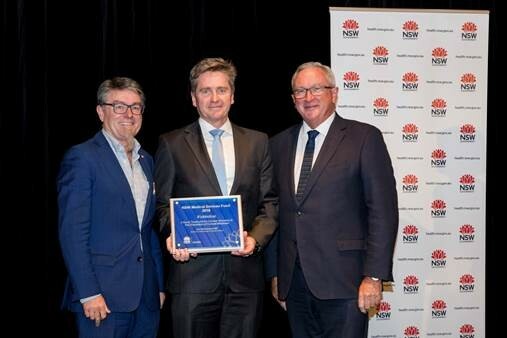 “We are committed to promoting local innovation to create a thriving medtech industry in NSW as well as improving patient outcomes across the state and beyond,” Minister Hazzard said. In 2017 the project was awarded $15,000 seed funding through the first Big Idea grant, administered by the Deputy Vice-Chancellor (Research) team.